ISLAMABAD/KARACHI: While Afghan Taliban chief Mullah Akhtar Mansoor may have used a fake name to obtain a Pakistani identity card, his credentials with the authorities are all genuine, verifiable on specific helpline numbers. Mansoor was reportedly killed in Balochistan in a US drone strike on May 21. 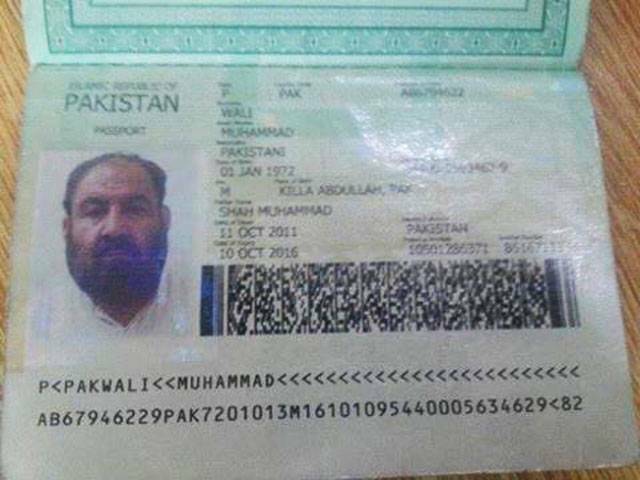 A Pakistani CNIC and passport found at the site identified the victim as Muhammad Wali, a resident of Karachi. The National Database and Registration Authority (NADRA), which issues computerised identities to Pakistani citizens, also facilitates verifying the basic credentials via short messaging services (SMS). When forwarded Wali’s identity card number 54400-0563462-9 at 7000 – a service to verify the CNIC holder’s name, the reply is: Muhammad Wali, son of Shah Muhammad. The voter registration details of any CNIC number can be obtained through a text message to 8300. Wali’s number shows he was a registered voter with the serial number 38, block code 454050104, ward number 31 in Chaman Municipal Corporation union council of Killa Abdullah district. While getting an identity card is a struggle for many Pakistani citizens, especially those living in districts other than their permanent address, the fact that Mullah Mansoor was able to get a Pakistani CNIC as well as a passport raises quite a few questions. According to the “current address” mentioned on the CNIC, Wali lived in Flat Number B-016 of Bismillah Terrace, Plot Number FL-03, Karachi. Interestingly, the address does not include the area of this residential building, which is actually located in Gulzar-e-Hijri, Karachi. A raid at the address in Karachi provided clues to the slain militant’s past as well. A suspected militant associated with the banned Tehreek-e-Taliban Pakistan (TTP) was among three people arrested in a raid by intelligence personnel at Bismillah Terrace near Sohrab Goth, a police source told The Express Tribune. The men were identified as Jabbar alias Charya, Haji Yousuf and Shaiq. Who will succeed Mullah Mansoor? Wali had purchased the property from Jabbar, who had been associated with a political party but later joined the TTP, the officer said. Since then, Shaiq had been living with his family on rent there, he added. Another source said Shaiq and Yousuf were later released while Jabbar was shifted to an undisclosed location for interrogation. Published in The Express Tribune, May 24th, 2016. @Ali: Yes living things like humans can’t bear drone attacks and die..but non living things (like his belongings – passport, documents) can with-stand it to survive. Note that Karachi address listed for CNIC was raided and TTP member arrested among others! Difficult to obtain GENUINE CNIC discovered raises questions of just who in government makes sure these Good Taliban types are provided official documents? Questioning the processing officers about these might reveal interesting results (though never to see the light of day)! @Ch. Allah Daad: You know who they are! Everybody knows who they are but no one can do anything about it. You just have to pray that one day true patriotism and true love for the country and concern for the wellbeing of the people will be born in their hearts. You have to hope that one day they will be moved by the colossal and wasteful loss of innocent lives.